There was once a group - scratch that, the Groop - of knob-twiddlers amidst the up-and-coming sea of other shoegazers and knob-twiddlers with a much different agenda; this Groop brought to their music a collective love of a widely-influential genre which was dismissively dubbed "krautrock" at the time of its inception, for a lack of easy categorization (as the music collected many elements of funk and jazz and mingled them with post-psychedelic and prog rock) and also due to its origin in Germany shortly before the world was taken hostage by punk rock. Seminal progressive acts such as Neu! and Can, among others, were hugely dominant references, and many elements of these bands' styles were applied to a masterfully-prolific songwriting engine (aka Tim Gane) which already combined elements of lounge and french orchestral pop music of the 1960's - and, yes, some early shoegaze aesthetic. This formula gave rise to over a decade of beautifully contiguous, kraut-infused post-rock masterpieces - such as 1994's Mars Audiac Quintet and 1996's Emperor Tomato Ketchup - as well as an act worthy of acclaim and responsible for influencing a whole new generation of alternative and post-rock groups. After the untimely death of harmonizing vocalist extraordinaire Mary Hansen in 2002, the Groop inevitably lost steam, and the engine slowed to a halt. 2004's Margerine Eclipse brought about a slightly reinvented machine, slicked and polished and surprisingly back in tact, yet Hansen's absence effectively took a leg out from under the Groop; if you lean a little too hard against the frailness and beauty of Stereolab's post-Hansen releases, it might just topple over. There are far too many holes in such a once-great formula - simultaneously static and dynamic, sonically - these days, despite founding member and singer/keyboardist Laetitia Sadir's best efforts to patch it up and move ahead. 2008's Chemical Chords cannot be accurately reviewed by any serious Stereolab fan without the words "disappointing" and "uninspired" creeping to mind, and though there are a handful of truly decent (and even enjoyable) tracks gracing the album, the majority of Chemical Chords feels like an unsuccessful reproduction of a much more enthusiastic and purposeful release (being '04's Margerine Eclipse). Among the better of the fourteen tracks comprising the album, the opener, "Neon Beanbag", reintroduces the staples of Stereolab's tried-and-true style - a trebly, chunky bass line, some bubbly electronics and Laetitia Sadir's heavenly vocals (which still seem to attempt to conjure up the phantom pipes of one Mary Hansen), as well as a melodic french horn cameo - into a motorik-meets-Mozart harpsichord-rocker. "Three Women" revisits the pure minimalism and lengthy, chugging nature of Stereolab's past efforts (see Mars Audiac or Switched On Vol. 2), and "One Finger Symphony" proves fitting within the bubbly, summer lounge vibe of 1997's Dots and Loops, though a little bass-heavy and operating within much too short a time frame for any Stereolab tune to fully develop. Luckily, our title track is a shiner, seeing symphonic, Parisian-pop bliss interspersed with Sadir's tastefully percussive vocals. The record begins to become much more insipid with "Valley Hi! ", as Neu! bleeds right through the tune at the onset; Sadir's vocals once again save the day, however, jerking this track out of the crowded bowels of the krautrock wasteland known as "indie rock" - a wasteland the next track, "Silver Sands", does not so luckily escape. "Self Portrait With 'Electric Brain'" and "Cellulose Sunshine" do much to attest to the Groop's incumbency yet as clear pop masters, but it's the closing tune that proves the most satisfying of the lot, sounding as if it were lifted straight from the threshing floor of the Margerine Eclipse sessions; a bass-driven, harpsichord-infused and vocally stimulating track, indeed. 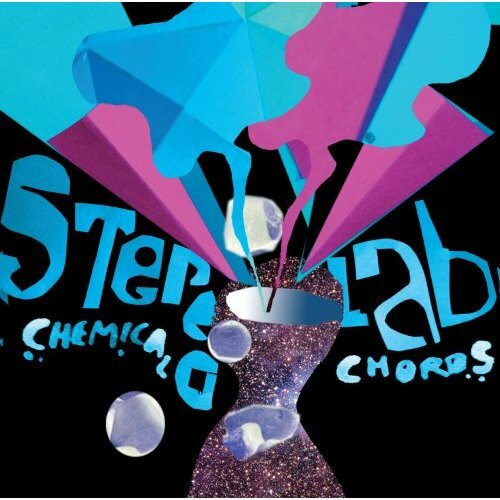 Though 2008's Chemical Chords may not be the reassurance Stereolab fans were seeking that the strength and endurance of the Groop's beloved formula is still intact, it does prove that they're completely unwilling to lapse into creative stagnation, which - considering how long the Groop has been at it and just how much they have been through - is quite a reassurance in itself.